A choice of top batten for light and heavy days is useful. On light days a softer top batten – especially flexible toward the forward end – will reduce the tendency for bumps at the batten end. Take care that the battens are all inserted flexible-end first and centrally seated on the pocket elastic. Check that each pocket has a telltale at the leach. Fit only the reef clew lines you intend to use in the race. Genoa: cover the spreader ends and stanchion tops, have the tack fitting fixed firmly and close to the deck and forestay. 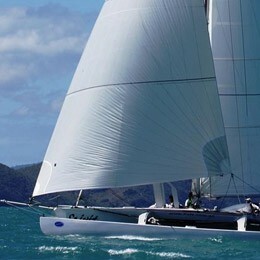 The prefeeder should be approx 200mm from deck really close to the forestay. Spinnaker: Check the spinnaker for any damage. Make sure it is packed and ready for action. 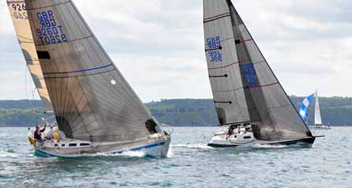 Mainsail: The boom should be kept at or close to the yacht centreline and the top batten parallel with the boom until you are overpressed. The leech telltales should all flow continuously except the top which should intermittently stall. Sheet, traveller and kicker are continuously adjusted to achieve these aims. Too much fullness will result in excess heel and helm. The sail can be flattened and the leech opened. The sail can be flattened by bending the mast. However too much mast-bend will result in creases running from the clew to mid-mast; if this happens, reduce bend. As the wind increases the draft must be held forward in the sail by increasing halyard and Cunningham tension. Excess weather helm can be reduced by dropping the main traveller or by easing sheet. It is essential that the trimmer and helmsman maintain a dialogue so that the leach is tight enough for good pointing while not demanding excess helm. Good steering is a partnership. Genoa: The shape required of the genoa is similar to the main, but with a slightly more rounded luff. This is achieved and maintained by adjustment of the luff, leach and foot tensions. Increase halyard tension just sufficient to move fullness forward to 45%. More luff tension forms a knuckled luff for lower pointing and higher speed. Kevlar/carbon sails do not require as much halyard movement. If the wind increases progressively increase backstay or runner tension. We fit three sets of telltales. The middle set should lie as shown with the windward one lifting frequently and the leeward one streaming. When too close to the wind the windward one rotates (fully stalled), leeward one streaming. When too far off the wind the windward one is streamlined whilst the leeward one is stalled. Trim the genoa in for beating, ask the helm to sail up gradually to just above close-hauled. Observe which telltale lifts first. If it is the lowest telltale, move the lead aft; if it is the top telltale, move the lead forward. When they all lift simultaneously you have it right! 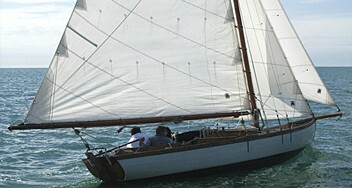 When over pressed, the sail should be flattened and twisted off to depower moving the lead aft. Leach lines on mainsail and genoas should be tensioned just enough to prevent flutter and should be adjusted to suit the conditions. Fast sails need free leeches to let air exhaust cleanly through the slot. To Windward: Check that the curve of the genoa leech matches the back of the mainsail. The genoa should be slightly more open at half-height. The spreader end acts as a good guide to correct trimming. In medium conditions, keep the genoa a couple of inches off the spreader end. In a smooth sea, the boat can be pointed higher by sheeting to the spreader – keep a trimmer working the sheet to hold the chosen position as the wind varies. Reaching: A two-sail reach requires that the genoa leads must be moved out to the toerail and forward to keep the leech shut. 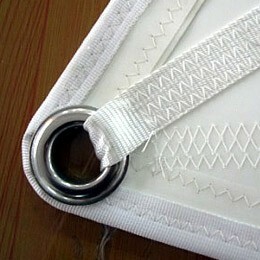 Ease the halyard to keep the draught aft and check that all the genoa telltales lift together. Spinnaker Pole: The pole should be set at right angles to the masthead wind indicator. It is essential that the spinnaker pole height is adjusted as well as fore and aft constantly. Do not just concentrate on the sheet. Pole height is set to keep the clews level. 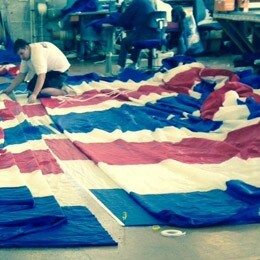 Spinnaker Sheet: Adjust the spinnaker sheet lead fore and aft to achieve first sign of luffing at half-height. 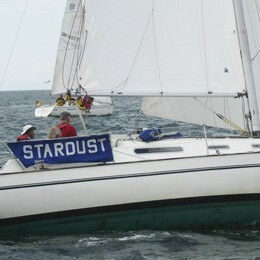 Usually the lead is aft on a reach and forward on a run adjusted by use of Barbour haulers. The sheet should be kept eased to maintain the slightest curl on the luff. 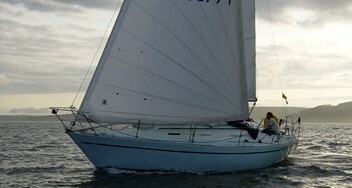 If the sail collapses, sheet in hard immediately but when the sail refills release again to the curl position.